My friend Jared and I have known each other for nearly twenty years. I have watched him morph from an 18-year-old college kid into a man with a wife and a son of his own. I think it’s fair to say that there are few people on this earth who make me laugh as much or as hard as Jared, so I always look forward to his texts. I can thank him for this gem. I love it. I truly love it. It makes sense, it’s funny, and Boar’s Head was even kind enough to slap the ribbon on the low sodium version of their product; I could’t be more appreciative. Thanks to Jared, I don’t have much work to do on this one. 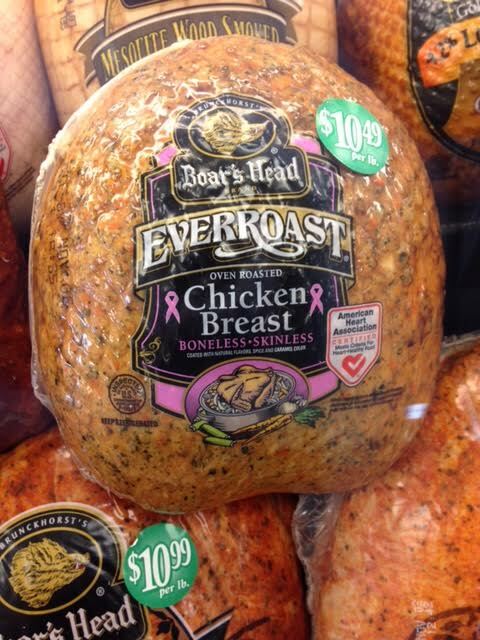 I mean seriously, nothing says chicken breasts like breast cancer! < Previous Deal With It!